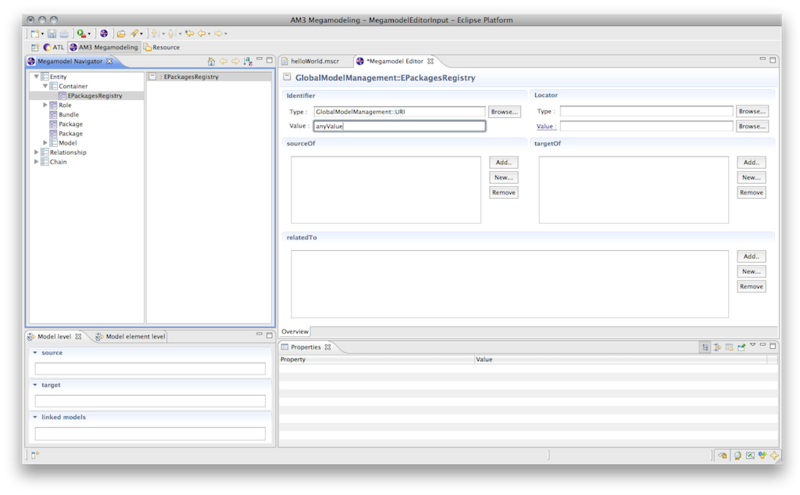 The MoScript prototype (extending AM3), being developed by the AtlanMod Team, is part of the MoDisco project. It provides a textual domain-specific language for model management. The goal of MoScript is to provide AM3 with a textual domain-specific language for model management, improving its model management task orchestration expressivity. With MoScript, users can automate model management tasks by means of OCL based scripts. For instance, user may write queries (based on model content, structure, relationships, and behavior derived through on-the-fly simulation) to retrieve models from model repositories, manipulate them (e.g., by running transformations on sets of models), and store them back in the repository. MoScript also allows to populate and update the megamodel automatically by doing reverse engineer of simple modeling artifact repositories. Download the ATL source code project set file (.psf) from here . 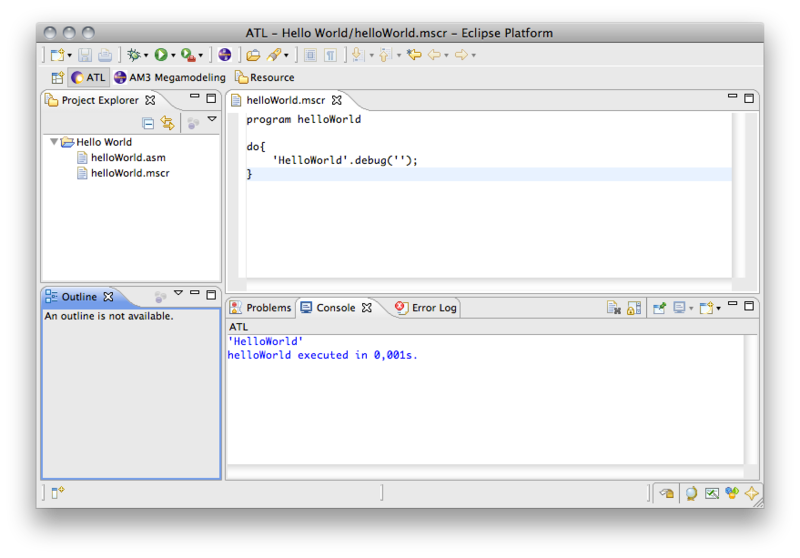 Import it into Eclipse with File->Import->Team->Team Project Set. Download the MoScript patch for ATL from Bugzilla – Bug 361688. Click right click on any ATL plugin project and select Team->Apply Patch ... and select the patch to apply it to ATL. Install sublcipse and subversion if you have not done it yet. 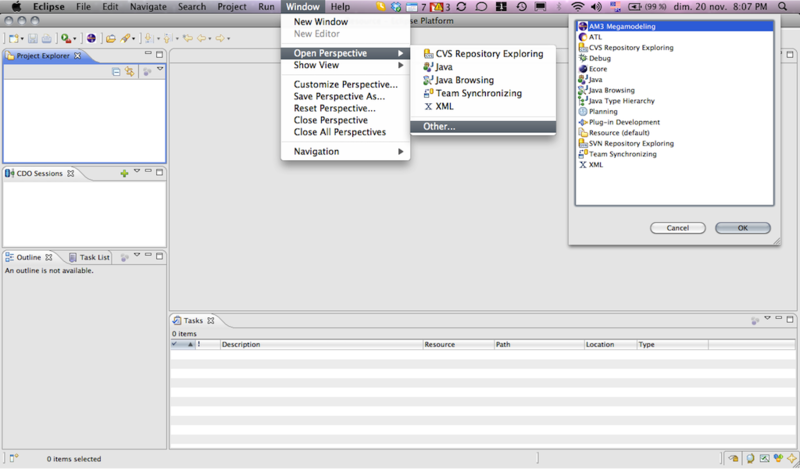 Open the SVN perspective by selecting Window -> Open Perspective-> SVN Repository Exploring perspective. You can find from this section the documentary resources around the MoScript prototype and underlying approach. Create a new MoScript project by clicking on File-> New-> Project and selecting the MoScript project type under the AM3 Folder. After saving the file, if there are no errors, you should see a new binary file called helloWorld.asm in the project explorer or navigator. 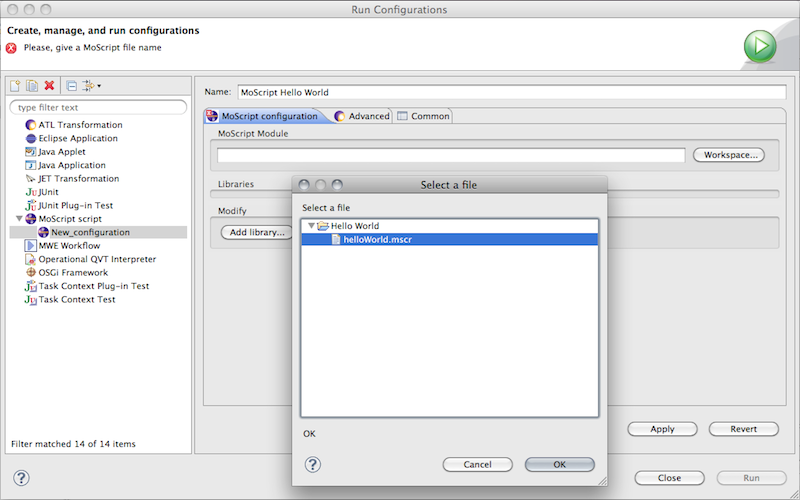 Browse in the workspace for the HelloWorld.mscr file and select it. Then, in the advanced tab, check the options Clear console before launch and Print execution times to console, so that you can clearly see when de script finishes. This is because the megamodel file has not been created yet. For creating the megamodel file, open the AM3 Perspective. Create any model element in the megamodel left clicking in any element in the left panel, selecting new [element]. Give any value to the element and then use File->Save option to save the Megamodel. With this operation the Megamodel file is created in the filesystem. Now try again to run the script by clicking on Run->Run History->Hello World and you should see the output in the console. MoScript reuses a big part of the ATL syntax and semantics such as the OCL expressions and data types, the control flow statements and the helpers. If you have any doubt about MoScript syntax please try to solve it by using the ATL syntax. Please note that MoScript does not know the notion of Rule in any form. The using section is optional, and is used for declaring variables and assigning their initial value. The do section is mandatory and is the core of the program. In it, operations are used in combination with control flow statements and OCL queries to perform modelling artefacts manipulations. Model element variables are referred to by means of the notation !Class. For instance, !Model, !TerminalModel, !ATLTransformation etc. This operation dereferences and load the physical model represented by the Model element. Then it queries the model and return a collection of OCL elements of type elementType. The elements of the resulting collection are used as entry points to the model, from where the rest of the elements may be reached. Subsequent queries to the model content are made with standard OCL expressions. This operation make a projection of model expressed in a textual syntax to a model in XMI conforming to a given metamodel. injectorName is the name of the injector that is going to be used to make the projection of the model and modelElement represents the metadata information that will describe the new model. The structure of the tuple is explained along with the register operation. This operation applies the a transformation to one or more models. The key is the alias of that identifies the model inside an ATL transformation module and model is a model obtained from the megamodel. concreteType: Is a string with the concrete type of the model element to be created. The string must be in the form of Package::ConcreteType. For instance GlobalModelManagement::URI, GlobalModelManagement::ReferenceModel etc. There are two ways for declaring reference tuples. The first one specifies first creates the element to be referenced and then references it, the second one asumes that the elements has been already created (in the same register operation), thus it uses the creationId of the element to be referenced to find it and reference it. 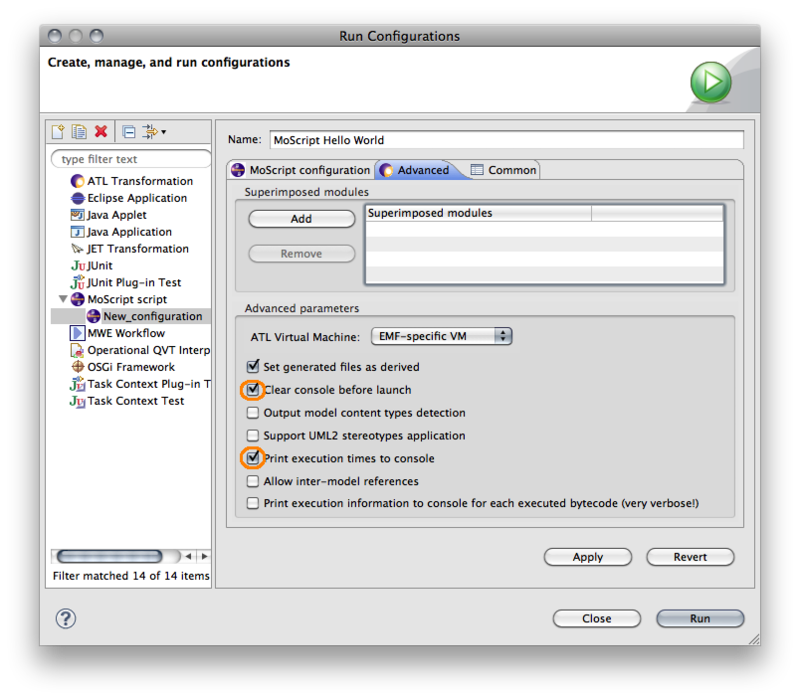 The creationId is just a kind of variable name given to the model element instance when it is created during the execution of the register operation. It is not mandatory if the element is not going to be referenced from another element created in the same register operation execution. Note that the Tuples are used as a recursive way of expressing the creation of model elements, the model elements referenced by this elements and so on, and also the atributes contained in each model element. This operation allows to remove any megamodel element which extends from the Core::IdentifiedElement element. Select all the models in the megamodel, get the first one and get a collection of all its elements of type EClass. Select all the models in the megamodel, get the first one and remove it from the megamodel. Select the models in textual syntax which conform to a given xmlRefernceModel (grammar), get the first one and the inject it with the XML injector to obtain an XML model in XMI format conforming to an XML metamodel. The xmlEcoreModelTuple contains the metadata information for the creation of the new model element like, identifier, locator, referenceModel etc. MoScript comes with a set of use cases showing different possible uses of the MoScript tool in various contexts and for varied purposes (similarly to what is done in the M2M ATL project). A general description is given for each of these use cases, as well as some more precise documentations for many of them. For some, prototypes have already been implemented and are directly downloadable from their respective page. 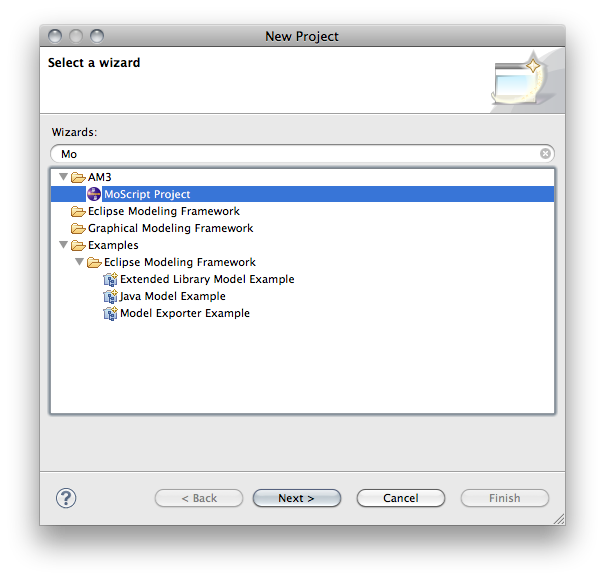 MoScript reuses different existing EMP (Eclipse Modeling Project) projects: To be completed. This page was last modified 12:02, 29 March 2012 by Wolfgang Kling. Based on work by Hugo Bruneliere.